Indie developer Red Hook has announced in a clever little way that its hit horror/fantasy RPG title Darkest Dungeon will be getting a Nintendo Switch port. The announcement came courtesy of the official Darkest Dungeon Twitter account, through which Red Hook recently posted a seemingly innocuous video clip of Darkest Dungeon gameplay. However, watching the clip to the end reveals that the gameplay is taking place on a Nintendo Switch in its portable handheld mode, confirming that a Switch port of Darkest Dungeon is currently in the works and apparently pretty close to being finished (if the footage in the clip is anything to go by). As of the time of this writing, no additional information is known about the Nintendo Switch port of Darkest Dungeon since all Red Hook has shared on the matter is the above Twitter clip. However, one can safely assume that Red Hook won’t keep fans in the dark (har har) for too much longer and that information like a release date and whether or not the Switch port will have any unique content or features will be revealed shortly. 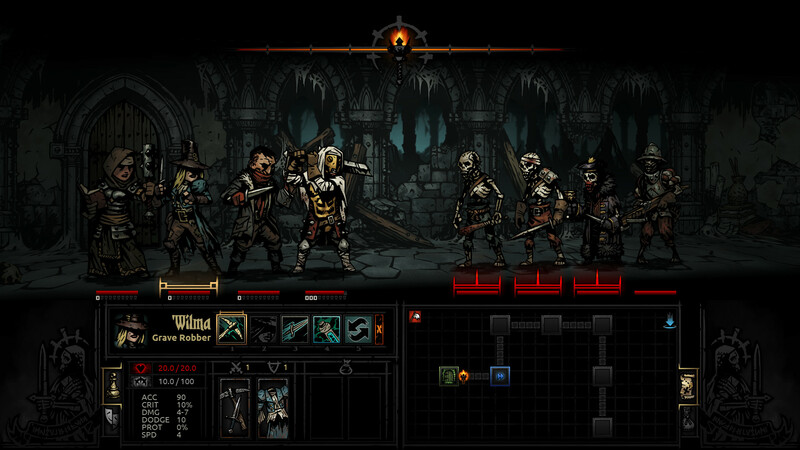 Darkest Dungeon, which is already available on PC, PlayStation 4, and PlayStation Vita (with the latter two featuring cross-play support), is a turn-based RPG that mixes elements of fantasy and Lovecraftian-style horror. The game allows players to recruit parties of stalwart adventurers, sending them on excursions into various monster-infested locales so that they can find treasure and, hopefully, escape before they are killed or driven mad. The player can then use that treasure to build up their personal hamlet, allowing them to more easily tend to and strengthen their adventurers so that they can then brave more difficult dungeons. For those who own Darkest Dungeon’s PlayStation 4 version, being able to quickly swap their save file over to the PlayStation Vita and take the game on the go is a hard-to-resist perk (though PC players do have access to mods, so you could argue each version has its pros and cons), and it’s one which Nintendo Switch owners will soon be able to benefit from as well.